Following the anti-Japanese war which broke out in north-eastern China on 18 September 1931, the Hainanese community in Singapore stepped up their efforts to establish learning institutions for the younger generations. It was against this historical background that Pei Chun Public School was established on 12 May 1933 by a group of Hainanese migrants concerned with the education of their children in a simple shophouse in Tanglin area, initially with an enrolment of less than 100 pupils, most of them from poor families living nearby. The medium of instruction was Chinese, with the teaching material confined to Chinese culture and history. For many years since then the general situation in Singapore and indeed throughout the world remained highly unstable. Wars continued to break out here and there and from time to time. Nevertheless, with steadfast determination of its founders as well as the full support of teachers and parents, Pei Chun had been able to weather the storm and survive even in the most adverse circumstances. There had been calls over the years for the formation of an alumni association to bind ex-students of the school together for the cultivation of lasting friendship and common interest. But in view of the frequent unrests all over the world, particularly in the Southeast Asian region, such calls had to be shelved until a more opportune time. Singapore itself had undergone many historical changes, from British colonial rule to Japanese Occupation and back to British colonial rule, before moving into the new stage of self-government, merger with, and subsequently separation from, Malaysia and finally complete independence. Even then the situation did not get better immediately. Much still remained to be done to overcome poverty among the people and improve the national economy. Our top priority then was nation-building. Fortunately, with good planning our economy soon began to thrive, followed by an overall improvement in our living standard and level of education. It was not until the early 90’s that the real opportunity had come for the establishment of an alumni association to rally together all those who had left the school over the decades. On 28 May 1993, Mr Chen Keng Juan, former Principal of Pei Chun, openly appealed, for the first time, at the school’s 60th Anniversary grand celebration dinner at Neptune Theatre Restaurant, for the formation of an alumni association of the school. His appeal was instantly greeted by overwhelming support from the audience present at the function. On 1 April 1994, a group of enthusiastic ex-students of the school formed a pro tem committee to draft a constitution for submission to the Registrar of Societies together with an application for registration of the proposed association. Following the approval of our application on 24 August 1994, the Pei Chun Old Students’ Association was officially established. The immediate tasks then were to embark on a large-scale membership drive and hold a general meeting to elect the first Executive Committee. For the past years since its inception, the association has been able to function smoothly with the full support of its members and, most of all, the complete dedication of members of its successive Executive Committees. Its membership, now standing at more than 900, has been growing steadily. 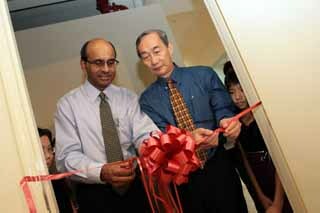 The associaton had since been renamed as Pei Chun Alumni Association.